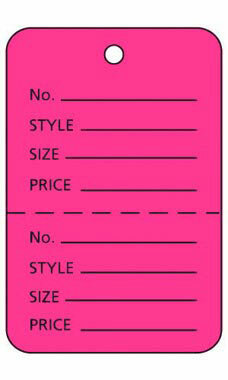 Really grab the attention of your customers with our Large Vivid Pink Unstrung Coupon Price Tags. Measuring 1¾"W x 2⅞”H, these large bright pink price tags will surely catch the eyes of guests who shop through your store! Divided into two sections by a perforated line, these coupon price tags provide customers with recording the product after their purchase. With pre-printed spaces to write in Stock Number, Style, Size and Price, the Pink Unstrung Price Tags offer ample room to provide all necessary information about the merchandise it's attached to. All large unstrung price tags are sold in boxes of 1,000.